My logo consists of a red heart with a nail through the letter “S.” At first sight this might appear to be a dollar sign inside a heart – perhaps signifying the love of money – the root of all evil. But that is not what it means to me. The letter “s” is written “es” in Spanish when you are describing it as a letter of the alphabet. The vertical object through the S is a nail, which in Spanish is “clavo.” When you put the two together in Spanish, you have “esclavo,” which is “slave.” So, if the heart signifies love, this could mean “slave of love.” This in turn could refer to the love of God, by God for us, or by us for God, or the committed love of marriage, or the passion or lust of falling in love. And just like the interpretation of the sexual Romanesque church art, the real meaning could be a combination of some or all of these. The symbol comes from the doorway, my friend Jose showed me, of a church in Madrid, Spain – San Ginés (de Arlés). 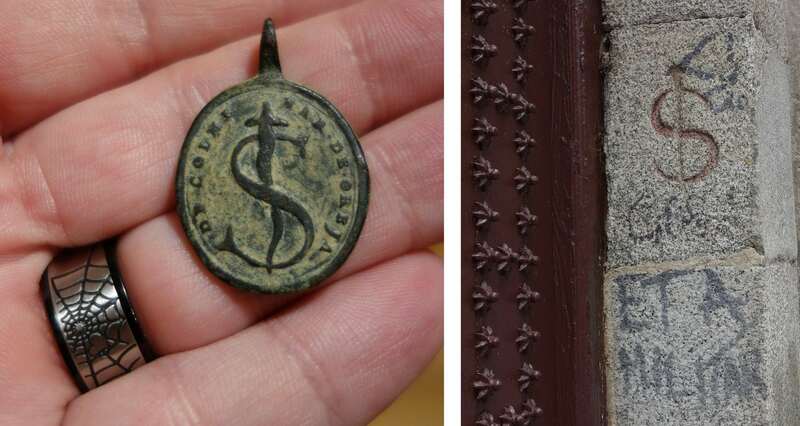 Here are photos of this doorway and a religious medallion with the S and nail. The door and the medallion both date back to the 1600’s. I used photos of a Medieval bronze heart, an ancient Roman “S”, and an ancient Roman nail to actually make the logo.